Essentially all customers restored except for scattered outages in hardest hit areas, and customers with meter damage. Customers should be prepared for possible scams. ST. PETERSBURG, Fla. -- Duke Energy tonight announced it has restored electricity to essentially all customers impacted by Hurricane Irma in Florida, though crews continue repair work on isolated, scattered power outages. In many of the company's hardest hit areas, repairs have included rebuilding the electrical system as a result of significant damage. The company has restored more than 1.9 million outages. Crews will continue working until all remaining isolated outages are restored. "Our power restoration work is almost complete. 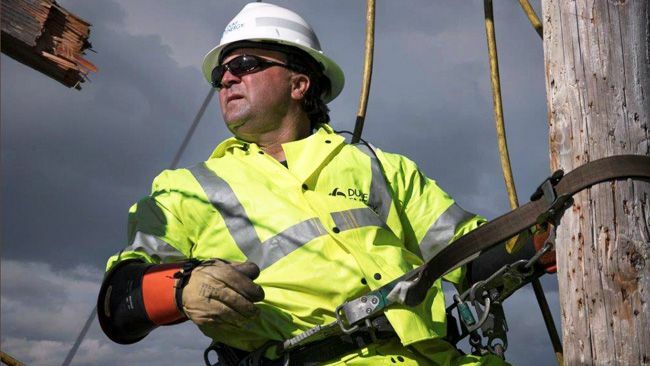 The finish line is in sight and we will soon have our final few customers' lights back on," said Harry Sideris, Duke Energy Florida president. "We thank our customers for their patience. We also thank the numerous utility companies from across the nation that provided assistance, as well as emergency responders and disaster relief organizations that helped restore our communities after this historic hurricane." Duke Energy's outage management system, which includes a map of outages and real-time updates, is now available for customers to access detailed information and estimated restoration times for their specific outage. At any time, customers without power can report outages online at http://duke-energy.com, text OUT to 57801 or call the automated outage reporting system at 800.228.8485. For the latest outage information and other company updates, visit http://news.duke-energy.com/irma. The hurricane forced the company to stop all standard meter readings, which means some customers will receive estimated bills. The next month's meter reading will determine a customer's actual amount owed. Duke Energy apologizes for any confusion and inconvenience this might cause. Late payment fees will not be applied for the next month to give customers time to recover from the storm. Customers who have questions or need additional help with their bill can call 800.700.8744. Customers with damaged meter equipment may be delayed in receiving service. If a customer's electric meter box has been pulled away from the customer's house due to storm damage – and the customer has no power – the customer is responsible for contacting an electrician for permanent repairs. In some instances, an electrical inspection may be required before Duke Energy can reconnect the customer's service. An electrician can advise the customer. If the meter box has been pulled away from the house – but the customer still has power – the customer should contact an electrician to reattach the meter box. An electrical inspection may be required in this situation, as well. Customers should be aware of fraudulent misrepresentations that have been reported to law enforcement and through local media. Duke Energy will never ask a customer to purchase a prepaid debit card – or iTunes card – to make a payment. Customers who suspect or experience fraud – or feel threatened during contact with a scammer – should contact local authorities, and then the Duke Energy Florida phone number listed on their bill (800.700.8744). Never dial any phone number provided by scammers. Duke Energy is a Fortune 125 company traded on the New York Stock Exchange under the symbol DUK. More information about the company is available at http://duke-energy.com.